What worker bees do depends on how old they are. A worker a few days old will become a nurse bee that devotes herself to feeding larvae (brood), secreting beeswax to seal the cells that contain brood and attending to the queen. After about a week, she will progress to other tasks, such as grooming nest mates, ventilating the nest and packing pollen. Only at the end of her life will she become a forager, venturing forth to collect nectar and pollen for the colony. Yehuda Ben-Shahar, PhD, assistant professor of biology in Arts & Sciences at Washington University in St. Louis, wondered if this highly stereotyped system of task allocation wasnt somehow under genetic control. In an article published in the advance online edition of Genes, Brain and Behavior on April 6, 2012, he and colleagues from Washington University, the University of Delaware, the University of Illinois Urbana-Champaign and the Institute for System Biology in Seattle, demonstrate that the division of labor among honeybees coincides with the presence in their brains of tiny snippets of noncoding RNA, called micro-RNAs, or miRNAs, that suppress the expression of genes. Forager bees that venture out to collect nectar and pollen have higher levels of some miRNAs in their brains than nurse bees that are devoted to tending to brood. The pattern of conservation across species suggests that miRNAS, are important regulators of social behavior not just during the bees lifetime but also over evolutionary time. Ben-Shahar chose the honeybee (Apis mellifera) as his model organism for the genetic control of behavior because the worker bees display such well-characterized division of labor. Task allocation in honeybees is highly scripted, and yet the script is flexible enough to respond to labor shortages. If there arent enough nurse bees in the colony, nurses will stick with their tasks past the usual age limit, becoming what are called overage nurses. And if there arent enough foragers, bees too young for that role will rush to take it on, becoming precocious foragers. For the scientists this plasticity makes bees a very powerful behavioral model. By comparing overage nurses to precocious foragers it is possible to compare gene expression in different behavioral states without the confounding factor of age. Ben-Shahar was curious about the role newly discovered molecules called miRNAs might play in the control of behavior. Francis Crick, the co-discoverer of the structure of DNA, said in 1956 that the central dogma of biology is that DNA makes RNA makes protein  and protein then does the cells work, including activating other genes. The central dogma still holds, but in the past 50 years it has been enormously complicated by the discovery of many mechanisms for regulating gene expression, including a proliferation of regulatory RNAs. Among these are miRNAS, tiny snippets of noncoding RNA typically only 22 nucleotide units long that bind to RNA transcripts of a gene, reducing protein production and, in effect, silencing the gene. Micro-RNAs are known to regulate development and disease processes such as cancer, Ben-Shahar says. Because nobody knew much about the miRNAs in bees, Ben-Shahar and the papers first author, undergraduate student Jacob Greenberg (now a medical student at WUSTLs School of Medicine), decided to make a grand survey of the miRNA library in a bees head. They ground up heads, extracted the RNA from the tissue, sorted out the small RNA fragments, and sent those to a company that sequences DNA (or RNA, which is a similar molecule). Because the entire honeybee genome has been sequenced, the short sequences the company supplied could be compared with the bee genome and non-matching sequences discarded as junk. Various criteria were applied to the remaining sequences to whittle the candidates down to true miRNAs. All of this sorting and sifting was done in collaboration with Weixiong Zhang, PhD, professor of computer science and engineering in the School of Engineering & Applied Science, who is an expert in computational biology. Zhangs lab has a lot of experience doing the bioinformatics part, which is important because not every little snippet of RNA is a miRNA; there are certain criteria they use to prove its an miRNA, says Ben-Shahar. At the end of this monumental cataloguing effort, the scientists had a list of 97 miRNAs that are expressed in the heads of honeybees, including 17 that had never been identified before, and many others that had been found in flies and mammals but not in bees. To design a manageable behavioral experiment, the scientists then selected five of the 97 miRNAs for closer inspection. These five were either very abundant or had been implicated in neural function in other organisms. The scientists then manipulated two colonies of bees to produce cohorts of nurse and forager bees that were the same age, either young for foragers or old for nurses. They dissected out the brains of their precocious foragers and overage nurses and measured the level of expression of the miRNAs in the brains with a sensitive test called the Northern Blot. We found that the level of expression of four of these miRNAS correlated with the task the bee was performing. Four of them were expressed at higher levels in foragers than in nurses. Because miRNAs typically suppress gene expression, this means genes actively transcribed in nurses were silenced in foragers, Ben-Shahar says. There is clearly a task-related difference, but we dont yet know what the gene targets of the miRNAs are, he says. Could miRNAs be playing a much broader role in the behavior of bees, not just regulating the tasks workers performed but also their social behavior more generally? Honeybees are eusocial insects, meaning that a colony behaves more like a superorganism than a gathering of individuals. The scientists knew that the genomes of several other eusocial insects had recently been sequenced. Did the eusocial insects share miRNAs, they wondered? 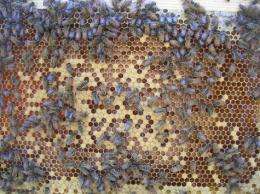 The grand survey of miRNAs had identified 20 miRNAs that seemed to be honeybee-specific. To test their idea, they looked for these miRNAs in the genomes of four other eusocial insects within the hymenoptera (an order of insects that consists of ants, bees and wasps) and in that of a solitary wasp. A total of 19 out of the 20 miRNAs that had initially appeared to be honeybee-specific were also identified in the genomes of the other eusocial insects. Moreover, five found in all the eusocial hymenoptera were found in no other species. And none of the 20 miRNAS found in the eusocial insects were found in the genome of the solitary wasp. Once a miRNA assumes a functional role it is rarely lost from an animals genome, Ben-Shahar says, because it typically regulates multiple genes and is too thoroughly enmeshed in the cells regulation to be easily extracted. This makes miRNAs a valuable marker for evolutionary relationships among species. The relationships among eusocial species could do with clarification. Ants and bees diverged a long time ago, and all ant species are eusocial, but bee species run the gamut from solitary to eusocial. That pattern makes sense, Ben-Shahar says, only if the eusocial trait evolved more than once as new species evolved. Something in hymenoptera DNA may have made that group of animals more sensitive than others to whatever evolutionary pressures led to social behavior, he says. Genetic control of human behavior is undoubtedly more complicated, Ben-Shahar says, but he points out that the human genome encodes close to 2,000 miRNAS, including two of the five he studied in bee brains, and these 2,000 miRNAs are thought to target roughly 60 percent of our genes.